Based on extensive public input over the past 18 months and careful consideration of the best course of action to address current and future needs, the Guilderland Public Library Board of Trustees has formulated a plan for renovating and enhancing the building, which is more than a quarter-century old and operating at or near capacity. Tuesday, April 16 at 4:00 and 6:30 p.m.
Tuesday, April 30 at 2:00 p.m.
Thursday May 9 at 1:00 p.m.
Library Director Tim Wiles (and Architect Paul Mays from Butler Rowland Mays LLP on April 16 and May 2) will present the finalized plan and answer questions. Tim Wiles is also presenting this information to various community groups. We encourage you to vote Tuesday, May 21, 2019 at your designated Guilderland elementary school. Voter information is posted below. To download a PowerPoint presentation on the draft plan, click here. To view a video of the architect’s presentation on the proposed renewal, click here. To read the Altamont Enterprise’s March 22, 2018, article on the proposed renewal, click here. 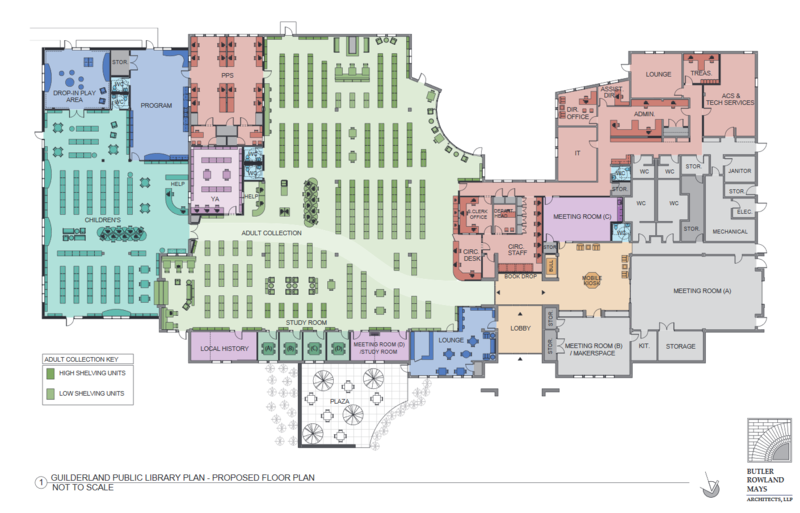 To view a printable version of the proposed floor plan, click here. Voter registration in advance is required. You must be registered with Guilderland Central School District or Albany County prior to May 21. Contact the Albany County Board of Elections during normal business hours, or School District Clerk Linda Livingston at 518-456-6200, ext. 3125. To vote in this election, you must be 18 years old, a U.S. citizen and a resident of the Guilderland School District for at least 30 days prior to the vote. You must vote at the elementary school in the zone where you live. For more information, call the district clerk at 518-456-6200 ext. 3125. Not sure which elementary school you use to vote? Absentee ballots will be issued, upon request, to residents of the school district who will be out of town or unable to vote in person due to illness or disability. To vote via absentee ballot, district residents must first complete and sign an absentee ballot application. Download the absentee ballot to fill out and send to the district. If you are unable to access the absentee ballot, contact Linda Livingston at 518-456-6200, ext. 3125 to have one mailed to you.